As the shower of sweets rained down I had to keep reminding myself that this was a gesture of goodwill from the 3 Kings as they rode through Los Cristianos. Children, and a fair few adults, formed a festive scrum on the pavement trying to grab a few of the stray sweets that hadn’t been caught and squeals of delight rose above the sound of the marching band that headed the procession. 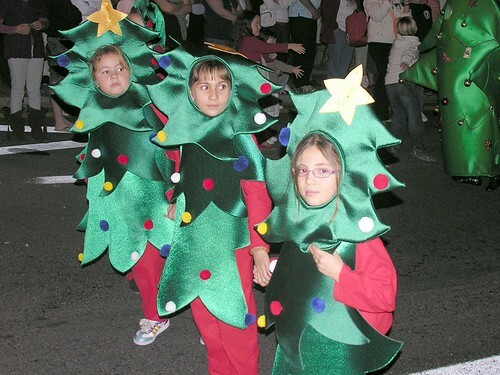 Aah christmas Spanish style is always a delight. Walking into town the supermarkets were heaving with shoppers topping up on food ahead of the big day Reyes Janaury 6th, and the bakers were doing a roaring trade in Roscons, the traditional ring shaped christmas cake stuffed with cream, fruit and many other tasty variations. My timing was good as the procession had started pretty well as advertised at 7.15 pm from the port. Every vantage point on the harbour wall was taken and the street leading up to town was lined with expectant families. I squeezed into a good spot and waited as the procession approached, much bigger this year and with more groups of children in fancy dress and the usual fire jugglers, acrobats and musicians. 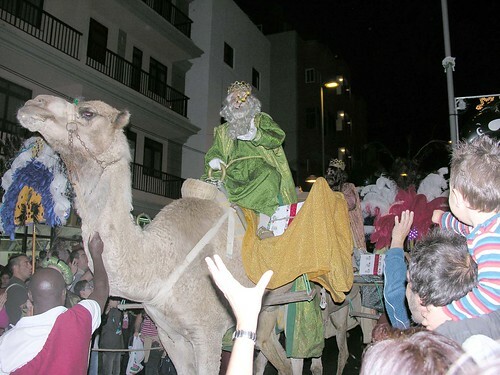 The kings were as always the star attraction, Gaspar, Melchor and Balthazar arrived perched on their camels and spraying great handfuls of sweets to their eager fans. All over Tenerife similar scenes were taking place, in Adeje the kings arrived by helicopter and in Santa Cruz they were holding court in CD Tenerife’s Heliodoro ground. 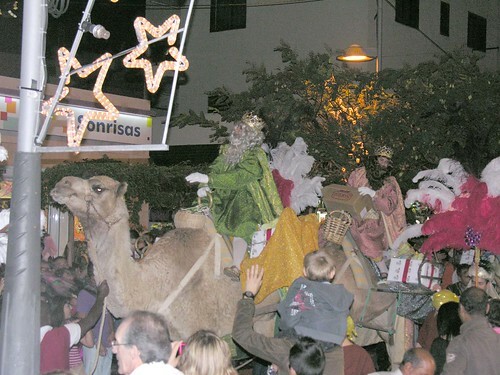 The Reyes tradition marks the arrivsal of the original 3 kings at the stable in Bethlehem with their gifts for the new born baby, sadly this year someone stole the baby Jesus from the crib in Santa Cruz. 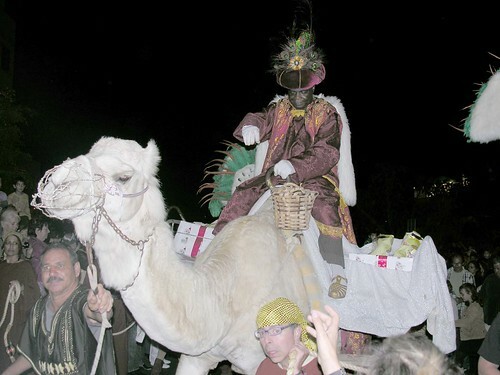 The camels are always remarkably calm for their annual pilgrimage through the streets but then these are showbiz camels, they probably have their own agent to negotiate their fee. As the parade turned into Avenida de Suecia the crowds grew even bigger and I had to duck and dive my way through to get some pics as the kings headed towards the cultural centre and their thrones. It was quite cramped as police tried to keep people out of the direct path of the camels and it was a living hell for me to be pushed up against all those young yummy mummys but I stood firm. The arrival at the cultural centre plaza and the dismount of the kings is always a slow process so I adjourned to The Devon Arms for some Dorada and made my way slowly to the plaza. The kings had taken their place on their thrones and were engulfed in a sea of small children, some with parents, waiting to take their turn to meet a king and receive a present, this year wasn’t quite as well marshalled, last year children were invited forward a group at a time but now it was a tidal wave of toddlers. The goats and chickens were taking it all in their stride in their barn area so with a long magical night ahead I popped off for a few beers on my way home. Unsure of their positions, constantly wandering away from the action and looking lost and forlorn, well that was the plight of the smokers in The Royal Oak but although CD Tenerife were not much better at times, there was more character in their 2-2 draw at Valladolid. Captain and right back Marc Bertran was suspended for the game so Pablo Sicilia filled his position with Nino wearing the arm band and both responded well. There was a nightmare start as the home side took the lead after 8 minutes, Prieto sliced a clearance high and it broke to Oscar who gratefully stroked it into the net. 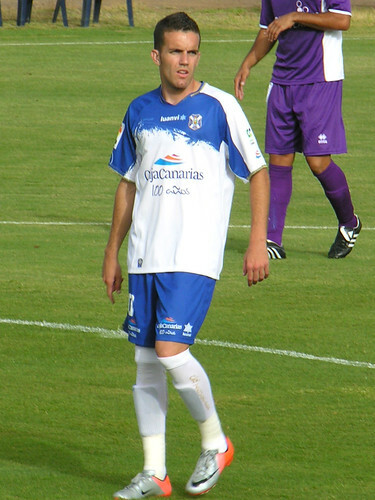 Tenerife responded quickly, Nino saw his long range blast just miss but Julio Alvarez put in a great cross for Nino to despatch for a 10 th minute equaliser. Sadly after that lifeline Tenerife lost their way and let Valladolid take control, the CDT midfield seemed to be missing in action, maybe they also popped out for an illicit ciggie, Ricardo was back to his invisible worst and even Mikel couldn’t get the engine running. Valladolid came back in style, former Pio, Nauzet took a free kick and curled in a stunning shot into the top corner with Sergio Aragoneses well beaten. At least defensive flop Prieto went off injured and Luna slotted in nicely alongside Melli but it looked like another big defeat might be a possiblity. Tenerife showed their best form at the start of the second half, Beranger was taken off at half time in favour of Iriome, maybe Mandia has finally realised what a poor excuse for a defender he is. There were some seriously scarey moments, Sergio stood firm in goal especially after a triple salvo at goal which they somehow repelled. Julio Alvarez was getting more involved and Nino as always ran every yard, his christmas wish list mustÂ have included a big strike partner. The game looked to be fading away from Tenerife but with 5 minutes left Iriome popped up at the post to plant a perfect header into the home net. Maybe it wasn’t the best performance but a few good signs and a vital point ahead of 4 home games in January. Another 5 yellow cards could be storing up more problems for Tenerife, even more reason to bring in some new players – over to you Juanjo Lorenzo our new Sporting Director. 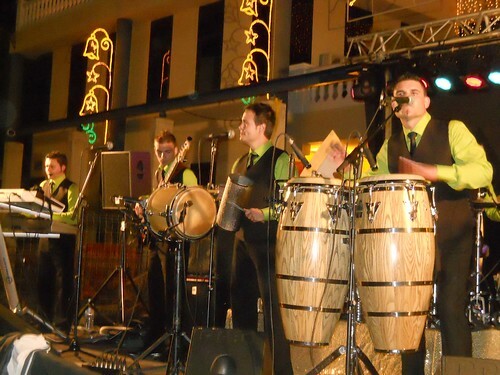 Tradition is a wonderful thing and on New Years Eve here in Tenerife that means fireworks, music, grapes and Cava, some head for the town plaza but beach boys like me head down to the coast. Los Cristianos was almost chilly after a sunny afternoon as I headed down the hill and early rockets and bangers had been popping since late morning. 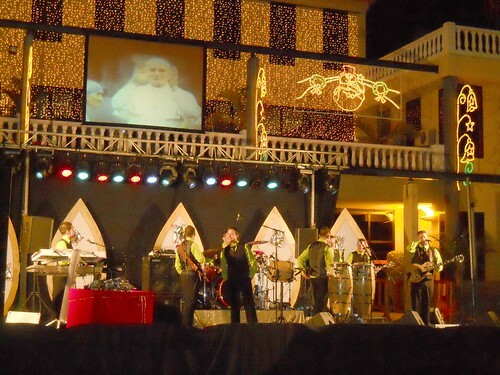 The Cultural Centre is one of the focal points for celebration and a stage had been rigged up outside and was now rocking with a latino dance beat and a snazzy light show. Several temporary drink kiosks ensured that limbs and feet were loosened up enticing many mature recruits to the dancing, it’s all about rythm, one experienced local wove his spell by rasping a file on a cheese grater, well technically it was a percussion instrument. A throbbing deep in my pocket was nothing to do with the slinky female dancers, just my mobile ringing with an invite from Bob of the Armada Sur to meet him and family down at the sea front for a pre midnight beer or two from their well stocked carrier bag. Crowds were already milling along the promenade as the lookie lookie men did a steady trade in silly party hats and chinese lanterns headed skyward with small fires in their baskets. As the magic hour approached crowds took up prime positions with many heading down onto the sand and bottles of champers and Cava were clutched in readiness. Spanish tradition dictates that a grape should be eaten on each chime of midnight, easily synchronised in some places but with the church plaza bells some way back from the beach there was an element of guess work to welcoming the new year. Most took the whoosh of the first rocket as the signal to embrace, shake hands and wash grapes down with bubbly. 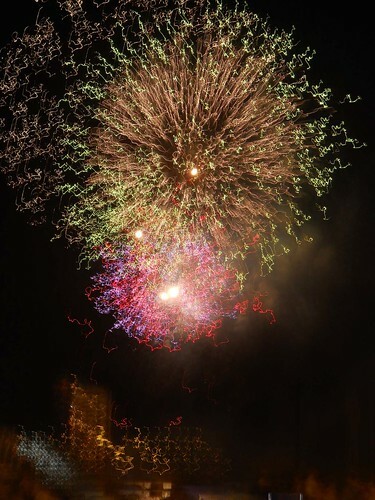 This year more than ever the large hotels around the wide arch of the bay dominated the foreworks displays, Arona council are feeling the pinch and understandably cut back on their explosive contribution. It was still an impressive sight as noise and colour ripped through the sky to a chorus of oohs and aahs. Our party had been joined by The General and the Bournemouth section of the Armada Sur and our shared wishes for the year ahead were centred on a revival for CD Tenerife. After the 15 minutes of fireworks we split and went our seperate ways melting away in various parties, many stayed to dance at the beach but others streamed off to join their own celebrations. For my part I stopped off for a few beers at the Don John in the Apolo Centre and was even Livin On A Prayer at one point, thankfully most people had drunk enough to soften the impact of my demolition of Bon Jovi. Determined to actually see some of 2011’s first day i adjourned fairly early and was in bed by 3 am. Taking the sea air later in the day my admiration of the Arona council cleaning department was further enhanced by the clean promenade, empty bins and bottle less beach after one of the biggest nights of the year. Take a bow those dedicated early birds you did us proud again.